Home » All Forums » [Miscellaneous Forums] » Miscellaneous - Off Topic & "Lighter Fare" » Have you tried? // Do you have? // Please "share". In this Information Age we are constantly being apprised of previously unimagined new technologies and "revolutionary" re-imagining's of the familiar. Rather than just diving in and buying something I thought it might be a good idea to ask trustworthy others to share their experience. I am posting this as a companion thread to one of my favorites here: "Products I really like". Here, we can post inquiries. Anyone try or have one of those 'revolutionary' mattresses -- Leesa, Casper, etc.? Is "Balance of Nature" a scam or as good as they say? We are getting a Chicken Salad Chick restaurant and I do chicken salad, am I going to or it? Chicken Salad Chick sounds like the Scotch Tape Store. Not something I'd go to even if they had beef, ham, and egg salad too. That's leftovers, not something to spend $$$ on. Never heard of Balance of Nature. Why not just eat the real fruits and vegetables? As a kidney patient, those would be a no go. That Chicken Salad Chick is very close to my Fast Food Family. Yes, their choice of food rate 3 Fs! I'll have to tell them about it. The only way they'll get it is if Grub Hub delivers. They are pitiful! I would have to first have Classic and then try Fancy Nancy. Besides a little curry powder, don't mess with my chicken salad! I don't think there are any chain restaurants opening in California that work their way East. Even In n Out has ended their expansion. Keep it rare... keep it busy. Rare isn't the word I'm looking for. Sparse? I do like the boiled, spicy, shellfish places that have been opening under numerous different names. Get plastic bags of clams, crab, mussels, shrimp boiled with Cajun spices and hopefully a bib. ??? Does anyone have a Ninja Foodi "Tender Crisp" - a 2 in 1 pressure cooker + air fryer? 1 The Ninja Foodi claims to be all of these in one device. Frankly, I am only interested in the air-frying and pressure cooking. So, does anyone have one? Do you recommend it? 2) Does anyone have an air fryer? I threw my deep fat fryer away years ago. It smelled and was a general pain in the a$$. The air fryer looks to be a handy, relatively clean substitute. How does it do for, say, frozen breaded shrimp? Ninja is a great promoter - marketing company. Then, later the products seem to have recalls. I've seen people that use the air fryers on different chat boards and they all seem to like them. I noticed them when I was in Bed Bath and Beyond and they're huge. I don't have space in the kitchen for even an immersion blender! That said, the new, Cuisinart toaster oven combo thing looks neat but I already have a Breville. That all applies to me too; word for word. I wish I could justify getting rid of the Breville on my counter-top in favor of that Cuisinart combo that includes the air-fryer, but the Breville isn't that old and still works fine. I can't justify it. And like you, I have no more space to add another gadget. I'd have to get rid of something I already have to make space. I must have bought the Breville right before the air fryers became a thing. It's without a doubt the best toaster-oven I've ever had. And it does more things than any of the ones I previously had. But the one thing I'd really like that it doesn't have is an air fryer function. It will probably be a few years until I have one. I got the Cuisinart Air Fryer Combo for my wife last X-mas. We love it, although the 1st one crapped put after 8 months, but ABT (A Chicago Co w/ GREAT customer Service) replaced it in a flash. It also has a nice commercial appliance look, along w/ great functions. Exactly! I love the Breville. It was a gift from my brother. It's even better now that I discovered I can use disposable 8 x 8 foil pans I buy at the dollar store. I cook in 9x13 foil pans in my Breville all the time. I prefer it to the regular oven if I'm not cooking something that's too big. I can't remember the last time I made meat loaf any other way. It makes clean-up so easy. I think you have the larger model. That's the one my brother was going to get me and he called me from BB&B and told me that it's HUGE! I already didn't have enough room. This might show you how cramped I am. After my remodel was finished I had no work area! So, I purchased a 24 inch square stainless steel table from a restaurant supply and capped it with leftover quartz. The Breville is to the right side of the condiments next to the stove. CRAMPED! I have 3 different types of coffee makers in the kitchen. Now thinking I need to remove one. 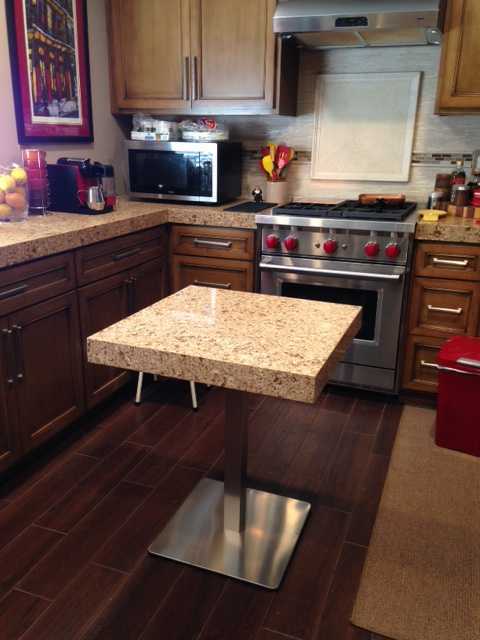 OH, for anyone wanting an island this one is perfect if you have a few more inches around it than I do. If my dishwasher is open I have to walk entirely around the table to get to the other side! Yeah. That's cramped. We're not THAT cramped, but my wife likes a lot of counter space to work on. Have you ever actually spent money to buy a countertop banana-hanger? Maybe you were just given one as a gift ... or re-gifted? What could possibly have been their original concept? ... as if fruit flies might be dissuaded by the additional height? Anyone here own a Spork? I want one just for the historical value. Just as there are "coffee table books", this must be a coffee table utensil. 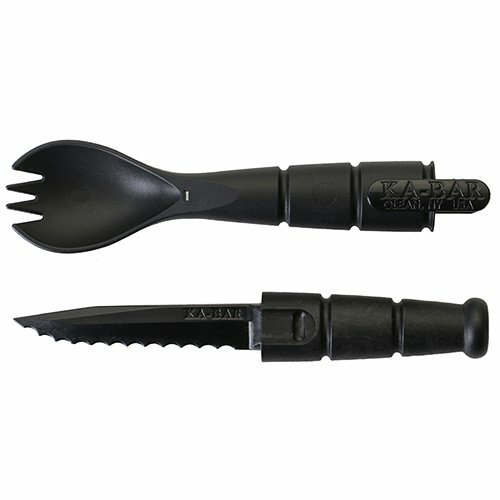 As the old saying goes, to "amaze your friends and startle your enemies"
We have 3 or 4 black plastic sporks, probably from KFC or Popeyes, in the tableware drawer and I often use them at work when I brown-bag it. I'd love to find one made of metal. I have or had stainless steel sporks in the cars. Thought they'd be good for travel. Have you noticed one of the tines has a knife edge on it? Amazon.com. The spork varieties are endless. Dining ala Trunk may never be the same. Got plenty of plastic ones from takeout, but no metal table sized ones.